I would consider myself to be a feminist mother, hence the title, and every day I face the following internal struggle: style versus practicality – for myself and, more particularly, for my daughter. Children need to be active (especially mine it would seem). It goes without saying, doesn’t it? From learning to roll and crawl to learning to scoot and ride bicycles children are built to be constantly on the go using every bit of their bodies, and yet so many girl’s clothes – dresses, skirts, tight trousers, ruffles and frills – are not designed to accommodate ease of physical movement. It’s difficult, though, because as a parent we may still wish to dress girls in more feminine clothing than their brothers – as a feminist I want to tentatively state that I don’t think there’s necessarily anything wrong in that. I don’t think there’s anything wrong with the construct of femininity unless it restricts our choices and capabilities and, in so many ways, little girls are subjected to exactly this by the clothing choices we make on their behalf and, later, that they make under the stern eye of social and peer norms. How many times have you seen baby girls learning to crawl, but landing on their nose because they pin themselves down on their own skirt? School girls trying to do cartwheels or climb playground equipment whilst simultaneously trying to ‘protect their modesty’ because their school dress or pinafore is not practical for those activities. Worse, even, you hear of little girls being told, by teachers, to keep their knickers covered whilst simultaneously being instructed to sit cross-legged on the floor: not exactly an easy task. It’s something I’m only thinking about now I have a daughter. I had always assumed, in a somewhat blase fashion, that I would simply dress her in her brother’s old clothes. When it came to it, however, not only were we gifted with huge numbers of hand-me-downs from family friends, but I found that I didn’t want her to be dressed in a strictly male and/or gender neutral fashion. Not every day, at least. (It is occasionally fun to mess with people by taking her out in all his old clothes and waiting for strangers to look bemused when they ask ‘his’ name and get told a girl’s). I don’t know why I feel like this. It probably is just an extension of those self-same gender norms and stereotypes I mentioned already that I know I am not immune to in any way. Or perhaps it’s wanting to make her a bit more like me, in some strange compulsion to ‘maintain’ or reinforce the maternal line . There is no really good reason for it. I keep berating myself with the meme I saw once about “colour coding your infant so strangers can visualise their genitalia” (grim thought, huh? ), and yet the desire to tweak her wardrobe to a more ‘girlie’ look remains. What I do not want, though, is to stop my walking-at-8-months baby from having the physical freedom it’s obvious she both needs and desires. This is where my love of bloomers began. I know I know, it’s a very frivolous thing to say when the first part of this post has been a serious discussion of how gendered norms in clothing help to enforce gendered stereotypes and limit girls’ achievements blah blah yadda yadda etc etc. It is, however, true. I adore wooly tights on fat little baby legs. I love being able to see those chubby knees. It makes me happy to make little complete outfits using accessories such as hats, tights and cardies. Dressing babies and children is so much more fun than dressing myself, it’s going to be one of the things I miss most when they get old enough to have opinions about the whole thing. Anyway. Bloomers are the answer. gathered at the waist, puffed out and blouson like skirts, showing off tights and/or fat little knees yet still leaving the legs completely free to crawl, walk, climb and explore in a way that a skirt just doesn’t. I only have two pairs for The Girl, but I’m hoping to buy some more, or maybe even hack a pattern to make my own. I strongly suspect that, as we move into summer, some rompers might make an appearance too. Look at her awesome stripy tights – and the amazing climbing she’s able to do at only 10 months old! My mighty girl. My 4 year old is still supremely uninterested in his clothes most of the time, unless he’s in the mood for his Elsa dress. Wonder if The Girl will be different? Oh well, that’s half the fun, right? Being a mum of two boys this isn’t really something I’ve ever considered. I know I hated wearing skirts and dresses when I was young, and thought it supremely unfair that a skirt was the only option for my school uniform. I think your girl looks adorable though, especially in her bloomers! 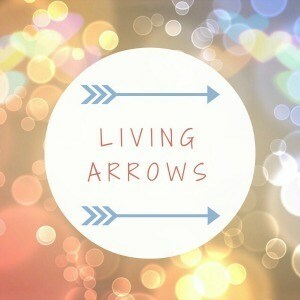 #LivingArrows. I used to love wearing skirts, so I guess as they get older you can just let them have a say, but at this age it’s surprisingly hard to be practical if you just love a skirt!